I’ve got the Heebie Jeebies! 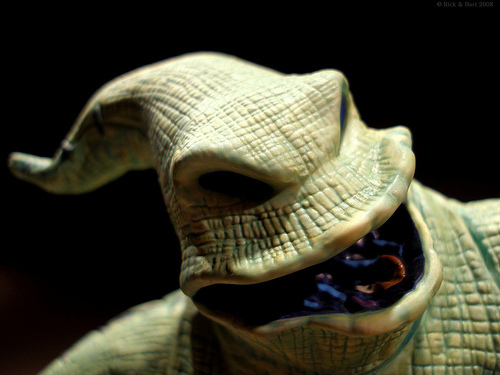 The Heebie-Jeebies, from the Oogie Boogie! That’s right, friends, I have actually been working on a costume, and it’s coming along swimmingly. I hadn’t announced this one first, because I didn’t want to get my own hopes up before I started working on it, and then have the thing come crashing down around me, like another costume which shall go unnamed (and which is still sitting in pieces off to the side of my work space). So, the “thinking of new costumes to do” track of my mind hasn’t been working as frequently as it did a few years ago. Trying to come up with ideas for upcoming Con costumes was like trying to make a donkey go where it didn’t want to go. Ideas just weren’t coming. And then, there was a bright flash of inspiration. I honestly don’t know what made my brain think of this one – I’m not a big fan of the movie Nightmare Before Christmas (though many of my friends are), and I hadn’t watched it recently. I think my brain just wanted something easy to do, easy to wear, and easily recognizable. Hence, my attempt at Oogie Boogie. I will say, despite not being a huge fan of the movie, I always did have a bit of a soft spot for the boogieman in it. 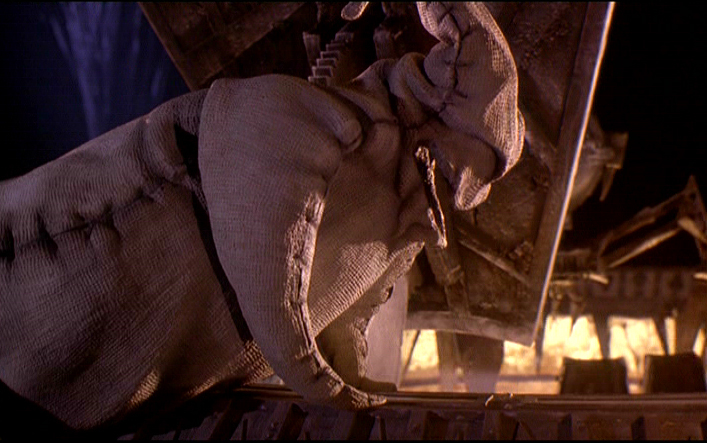 Not that I support attempting to murder Santa, but Oogie always just seemed a good deal more…cuddly. Strange, I know, but I liked the character. As I usually do, I started by pulling a couple of screen shots and concept drawings for the character from the web, so I had a visual in front of me to work from. I lucked out and found a huge cache of wire hangers in a forgotten closet of my house. Added to a roll of heavy gauge floral wire, some duct tape and some scraps of quilt batting, and I had the basics to form the frame of the head. The head for this costume fits a lot closer to my skull than many of the others I have made. It’s more along the lines of Kowl’s head, in terms of size and manuverability than, say, the Wise Man. I’ve still got to add some padding to the inside, to make the fit a tad more snug (so it doesn’t bang back and forth into my upper lip or my glasses) but I’m glad with the proportions so far. I used some upholstery foam scraps to add some shape to the head around Oogie’s eyes, and strategically tacked the fabric down in some place, to make sure the face was more three-dimensional. There is a small seam on the back of my Oogie’s head that isn’t in the film, but that’s bound to happen when you’re working with a medium like foam and fabric, and not clay. 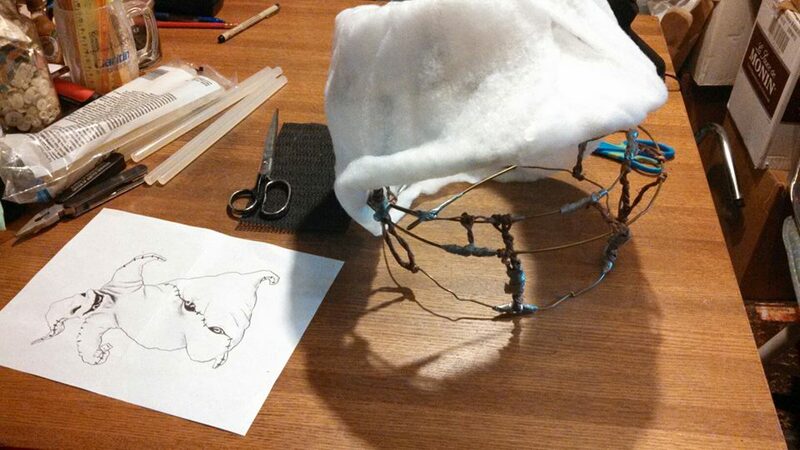 The wire frame for the head does not go all the way up and form a dome, like most of my costume heads have done. I wanted to allow for a slightly more floppy top, seeing as how Oogie Boogie resembles a sack that someone loosely sewed together and animated. That being said, I will probably add a little backwards-swooping wire line at the top, to support the floppy bit on the top a little more. In the picture here, the top is propped up a little with the help of a ruler, jammed between some of the interior supports. The only thing remaining for the head is to finish the mouth. Since the eyes are covered with batting, foam, fabric and felt, I will be looking out of the mouth of this costume. 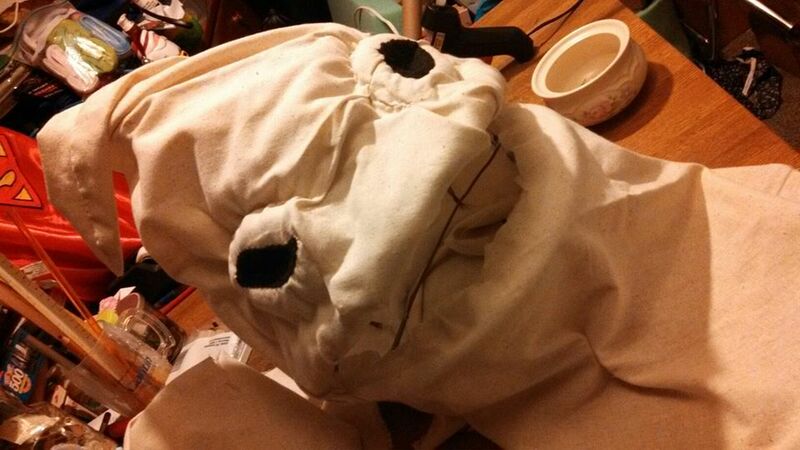 From my testing so far, I think this costume might wind up having the best vision of any of the heads I’ve made. Of course, I haven’t covered the mouth yet, so this could all just be hopeful thinking. The material for the mouth is going to be as see-through as I can make it. I’m thinking something along the lines of tulle or some other black sheer material. Something that will hide my face from on-lookers, but still allow me to see out. I had thought I had something sitting around the house that I could use. In fact, I’m almost certain of it, but I’ve been unable to locate it so far, which will probably mean a trip to the fabric store is in my future. Oogie Boogie’s body is also coming along well. I took a long swath of unbleached muslin over to Robert’s house last week, to make use of the massive amount of open floor space available there. I stretched the fabric out on the floor to the length I needed it, laid down, and had him trace around me, to get my basic shape. Then, I got up and cut out Oogie’s basic shape, keeping it in proportion to my own. I goofed a little when I cut the shape, and made the chest section a little close, which means I’m going to have to add in some room in the back, when I go to putting in the closure. It shouldn’t be too much trouble, though. I think it’s just going to require a little triangular flap for the velcro I plan to use. The arms are sewn and attached, but I already know that I need to go back and alter them. They’re a tad too long. And by “a tad” I mean at least 6 inches. I’m trying to decide whether to create a little flap that comes over, so I can use my hands without having to first take off the top half of the costume. It would make doing things like eating and taking pictures in costume a little easier (not to mention getting in and out of the costume by myself), but it would also mess with the original look of the costumes. Dilemmas and decisions! It looks like a long list of things, but all the tasks are pretty small, mundane things that shouldn’t, in and of themselves, take too much time. I’m hoping one more evening of working on this costume will have everything done! 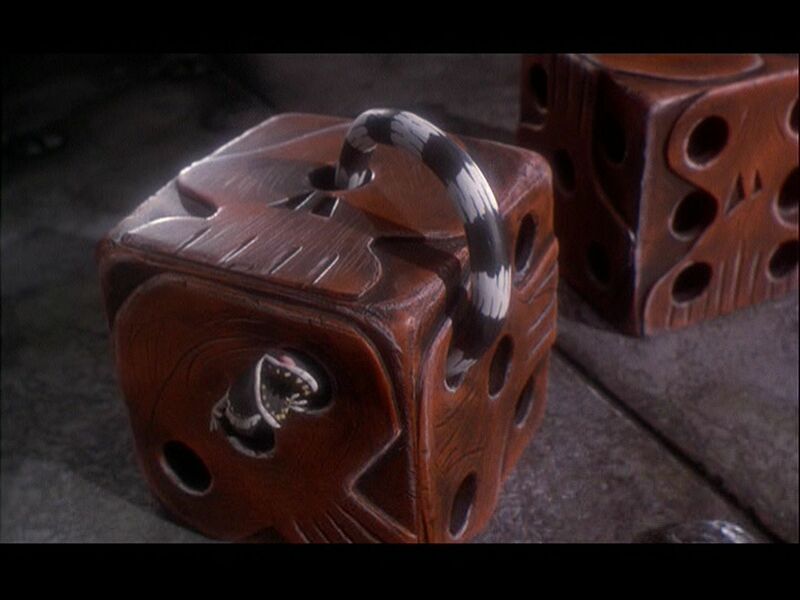 (and then I have to decide whether I want to make Oogie Boogie’s dice, too. ← Flailing Closer to Crunch Time.